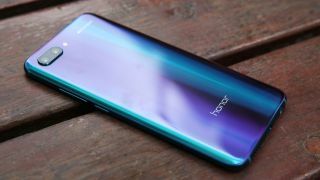 A new flagship Honor device is in the pipeline under the name Honor 20 Pro, and we've just heard from a leak that it may be launching before the end of this month. According to an unverified source from China, the phone will be launching on April 25 and is set to feature a variety of flagship specs. Take this all with a big pinch of salt, but while we don't have any evidence the source is correct it does sound plausible. The spec includes a 6.1-inch OLED display, a Hisilicon Kirin 980 chipset and a top-end variant with 256GB of storage and 8GB of RAM. It'll also come with 128GB of storage in either 6GB or 8GB of RAM versions. One of the surprising aspects suggested by the leak is that the phone will feature the newest Sony IMX600 camera sensor, which we've already seen perform well in the Huawei P30 Pro. If that's true, it's likely this camera will beat the Honor View 20. The leak suggests it'll be a 40MP shooter paired with a 20MP ultra-wide-angle shooter and 8MP telephoto that can do 3 times optical zoom. What's not exactly clear from the leak is whether this is a new version of the Honor View 20 or the expected sequel to the Honor 10. The specs seem like it could be either, but we had initially expected to wait a bit longer to see the Honor 20. The answer may be that it's a bit of both and the company has decided to streamline its products into one flagship series. Whatever it turns out to be, the leak suggests pricing in China will begin at CNY2,299 that translates to around $350 / £260 / AU$480. While April 25 is the rumored date for this launch, be warned that Honor often makes announcements in China long before the rest of the world gets to hear about them, so it may be that we don't hear about when the device is coming until later in the year.